Circuit for measuring the reactance of a reactance sensor (C1, C2) which varies responsive to a condition to be sensed, such as pressure, and which provides an output signal representative of the sensed condition. The cicuit comprises an oscillator (218) coupled to the sensor for providing a time varying oscillator signal to the sensor (C1, C2), and a plurality of rectifiers (220A) coupled to the oscillator (218) and to the sensor (C1, C2) for providing charging signals to the sensor and for providing discharging signals from the sensor. A control amplifier (216) is coupled to receive the sensor charging and discharging signals and to the oscillator (218) for providing an input control signal to the oscillator (218) as a function of the sum of at least two sensor signals wherein at least one of the sensor signals is selectively amplified (212) to enhance the relationship between the output signal and the sensed condition. 1. Field of the Invention. The present invention relates to linearizing reactance sensor circuitry and more particularly to capacitance transducers for measuring pressure. X = sensed variable M = sensitivity constant N = second order nonlinearity constant and, Q = third order nonlinearity constant It is desired that N and Q be as low as possible to give a desired linear relationship between the output signal, O, and the sensed variable, X. Prior art circuitry allows the third order constant, Q, to be adjusted as desired to minimize the combined effect of the second order term, N, and the third order term, Q. In the present invention substantially in dependent adjustment of the second and third order nonlinearity constants, N and Q, is made possible, resulting in substantially improved performance. SUMMARY OF THE INVENTION The present invention comprises a reactance measuring circuit for providing an output signal with enhanced linearity. The circuit comprises a reactance means which varies responsive to a condition to be sensed such as pressure. An oscillator provides a time varying signal to the reactance means. A rectifying means is coupled to the reactance means for providing sensor signals as charging signals to and discharging signals from the reactance means. A control means is coupled to the sensor signals and to the oscillator for providing an input control signal to the oscillator as a function of the sun of at least two sensor signals, wherein at least one of the sensor signals is selectively amplified. The selective amplification of at least one of the sensor signals provides an enhanced relationship between the output signal and the sensed condition. In one preferred embodiment, the output signal comprises a second order dependence on the sensed parameter. Selective amplification of at least one of the sensor signals compensates for such second order dependency, enhancing the output signal. In a further preferred embodiment, adjustment of one of the sensor signals is accomplished by an amplifier means. The amplifier means further comprises an impedance network for selective amplification of one of the sensor signals as a function of the impedance of the impedance network. Such selective amplification of one of the sensor signals has a predominant effect on second order linearity of the output signal with respect to the sensed condition. Use of an operational amplifier comprising the amplifier means improves the relationship between the output signal and the sensed parameter without substantially adversely affecting biasing or responses of associated circuitry, providing second order linearity adjustment. The second order linearity adjustment when combined with other existing circuit adjustments provides an improved output signal from lower to upper range limits. Thus, span, zero and range adjustments can be made without need for readjustment of linearity. FIG. 3 is a graph of end point linearity of a circuit constructed according to Fig. 1. DETAILED DESCRIPTION OF THE PREFERRED EMBODIMENTS In FIG. 1, a circuit embodiment of the present invention shown generally at 200 preferably is used in conjunction with an AC reactance type differential pressure sensor cell, and preferably has a pair of capacitors C1 and C2 at least one of which is variable, responsive to a parameter, preferably pressure. FIG. 1 basically is the circuit of FIG. 3 of U.S. Patent No. 4,381,677, issued May 3, 1983 to Ruesch, Frick and Grindheim, except the differences as noted herein. Basic operation of circuit 200 is fully described in U.S. Patent No. 4,381,677 and is further explained herein. U.S. Patent 4,381,677 has the same disclosure or specification as International Publication No. WO 82/02595. U.S. Patent No. 4,381,677. An output amplifier 230 having an output and an inverting input (as indicated by the minus (-) sign) is coupled at its inverting input to rectification means 220 and provides an output signal V0 to a suitable implementation means 232, such as a two wire current control, readout, device or the like which draws an output current signal I0. Equation 8 is derived by setting L = 0 in Equation 6 and dividing the numerator in Equation 6 by the denominator in Equation 6 until a first order pressure term appears leaving a remainder which is set equal to zero. Varying K1 and varying the capacitance of capacitor C3 , provides sufficient flexibility to substantially satisfy Equations 7 and 8. Adjustment of the capacitance of C3 provides a predominantly third order adjustment which in the past has been used to adjust the linearity of output signal I0 over selected ranges of pressure. In FIG. 2, a graph of typical data, where the output signal I0 is a 4 to 20 milliampere signal (as for example in FIG. 3 of U.S. Patent No. 4,381,677), expressed as terminal based linearity of output signal I0 versus pressure is shown with capacitor C3 adjusted to minimize third order dependence. 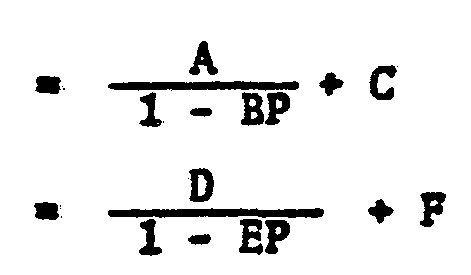 A second order differential pressure dependency remains having a maximum deviation from linear of approximately -.29 percent. Adjustment of k1 by selectively trimming resistors 250 and 252 results in a predominantly second order dependency control. In one embodiment resistors 250 and 252 preferably each comprise at least two resistors coupled in parallel, at least one of which is trimaable as by a laser to vary the parallel resistance. K1 is then the ratio of the equivalent resistance of the parallel resistors of resistor 250 divided by the equivalent resistance of the parallel resistors of resistor 252. when capacitor C3, resistor 250 and resistor 252 are correctly selected, a substantially linearized function results and Equations 7 and 8 are substantially satisfied. Resistors 250 and 252 can also be variable as a function of pressure or other parameter affecting second order differential pressure dependency. The present invention provides enhanced linearity from lower to upper pressure range limits allowing adjustment of span, zero and range (standard process measurement terminology) of the differential pressure transmitter without readjustment of linearity. Linearity is also enhanced when compared to linearizing by only utilizing third order adjustments. To partially compensate for second order linearity by adjusting capacitor C3, the third order dependence is not minimized, but optimized to account for both second and third order dependence, leaving both a third order dependence and a second order dependence. By selectively choosing resistors 250 and 252 and capacitor C3, both second and third order dependencies are substantially independently minimized resulting in a substantially linear relationship between the output signal I0 and pressure from lower to upper pressure range limits, enabling span and zero changes to be made over the entire range of pressure from the lower range limit to the upper range limit without need for readjustment of linearity. In FIG. 3 a graph of terminal based linearity of output signal I0 (a 4 to 20 milliampere signal) from a circuit constructed according to FIG. 1 shows enhanced terminal based linearity of output signal I0 with capacitor C3 and resistors 250 and 252 selected to improve linearity. The maximum deviation from linear is less than .04 percent. Capacitor C3 is selected to minimize third order dependence and resistors 250 and 252 are selected to minimize second order dependence. Comparing FIGS. 2 and 3 by subtracting their respective maximum deviations from linear (-.29 - (-.04) = -.25 percent) shows that unadjusted second order linearity is the largest uncorrected dependence after third order dependence is compensated. it has been found that a K1 of between 0.900 and 1.100, is sufficient to compensate for second order nonlinearity without adversely affecting associated circuitry. Preferably, K1, varies between 0.975 and 1.025. With K1 individually selected between 0.975 and 1.025 second order dependence is minimized in virtually every case. 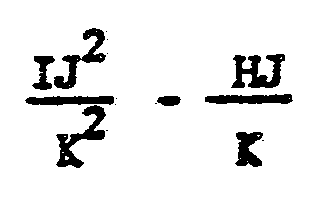 The above constructed circuit comprised resistor 250 having an equivalent resistance of 27,807 ohms and resistor 252 having an equivalent resistance of 28,088 ohms, resulting in a K1 of 0.990. in a further preferred embodiment of the present invention as seen in FIG. 1 of U.S. Patent No. 4,381,677, resistors 54 and 56 are varied to provide second order linearity adjustment and enhancement of the output signal. Resistors 64 and 66 also can similarly be varied. In FIG. 2 of U.S. Patent No. 4,381,677, it is within the scope of the present invention to adjust C3 and amplify i1, i2 or both in a manner described above to enhance the output signal. 1. A circuit for measuring a variable reactance means having at least two reactances, at least one of which varies responsive to a condition to be sensed, the circuit providing an output signal representative of the sensed condition, the circuit comprising: oscillator means coupled to the reactance means for providing a time varying oscillator signal to the variable reactance means; rectification means coupled to the reactance means for providing charging signals to and discharging signals from the reactance means, the charging and discharging signals being a function of the reactances of the reactance means; and control means coupled to the rectification means and to the oscillator means for providing an input control signal to the oscillator means to adjust the charging and discharging signals as a function thereof wherein one of the charging and discharging signals is selectively amplified to achieve a predetermined relationship between the output signal and the sensed condition. 2. The circuit of Claim 1 wherein the reactance means comprises at least one varying capacitor. 3. The circuit of Claim 1 wherein the sensed parameter is pressure. 4. The circuit of Claim 1 wherein the reactance means comprises at least a first and a second reactance means responsive to the sensed condition at least one of which is variable. 5. The circuit of Claim 4 wherein at least one of the charging and discharging signals responsive to the reactance means which varies responsive to the sensed condition is selectively amplified. 6. The circuit of Claim 4 further comprising: a first charging signal and a first discharging signal responsive to the first reactance means, and a second charging signal and a second discharging signal responsive to the second reactance means. 7. The circuit of Claim 6 wherein at least one of the first charging, first discharging, second charging and second discharging signals is selectively amplified. 8. The circuit of Claim 6 wherein the first reactance means varies responsive to the sensed condition and wherein at least one of the first charging and first discharging signals is selectively amplified. 9. The circuit of Claim 6 wherein at least one of the first charging and first discharging signals is selectively amplified. 10. The circuit of Claim 7 wherein the output signal has certain nonlinearities with respect to the sensed condition and wherein the selectively amplified signal substantially compensates for the nonlinearities. 11. The circuit of Claim 7 wherein the output signal comprises a second order dependence on the sensed parameter and wherein the selectively amplified signal substantially compensates for the second order sensed parameter dependence of the output signal. 12. The circuit of Claim 9 and further comprising: sum point means coupled to the control means and to the rectification means for combining the selectively amplified signal and at least one of the second charging and second discharging signals. 13. The circuit of Claim 12 further comprising: amplifier means coupled between a selected one of the first charging and first discharging signals and the sum point means for selectively amplifying said signal. 14. The circuit of Claim 13 wherein the amplifier, means further comprises: impedance network means for selectively determining the relationship between the selected signal and the selectively amplified signal. 15. The circuit of Claim 13 wherein the amplifier means further comprises a first operational amplifier having an inverting input and an output. 16. The circuit of Claim 15 wherein the impedance network means comprises: first impedance means coupled between the inverting input and the output of the first amplifier; and second impedance means coupled between the output of the first amplifier and the sum point means wherein the relationship between the first and second impedance means determines the selective amplification of the selected signal. 17. The circuit of Claim 16 wherein the selected signal is selectively amplified as a function of the impedance of the first impedance means divided by the impedance of the second impedance means. 18. The circuit of Claim 15 wherein the first and second impedance means comprise first and second adjustable resistors, respectively and wherein the ratio of the first resistor to the second resistor is representative of the selective amplification of the selected signal. 19. The circuit of Claim 9 and further comprising: output amplifier means coupled to the rectification means for differentially summing at least one of the first charging and first discharging signals and at least one of the second charging and second discharging signals. 20. The circuit of Claim 9 and further comprising: output means coupled to the output amplifier means for providing the output signal which has a substantially linear relationship with pressure. 21. The circuit of Claim 12 wherein the control means comprises a second amplifier having an input coupled to the sum point means and an output coupled to the oscillator means for providing the input control signal to the oscillator means. 22. The circuit of Claim 21 wherein the sum point means provides a signal representative of the sum of the selectively amplified signal and at least one of the second charging and second discharging signals to the input of the second amplifier.